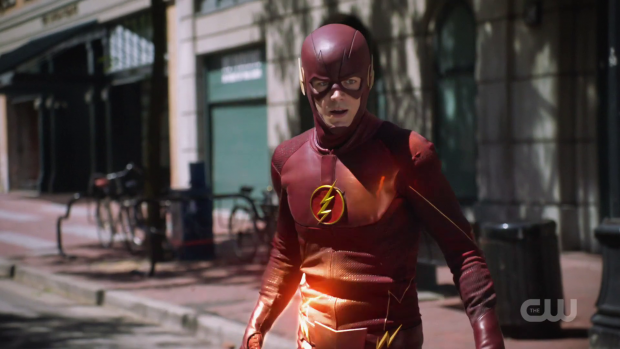 The Flash returns for a fifth season with a new cast member who brings her own unique problems to the show. Readers of this site will know that I considered last season to be particularly weak for this show. I won’t repeat the various issues that I had but sufficed to say I considered the show to be on a consistent downward spiral that showed no signs of recovery. As such a new season comes with a measure of trepidation as I was personally unsure if the show could be salvaged. It’s not possible for a single episode to change my mind completely but “Nora” certainly suggests that a return to form is possible. This episode does a lot of things right and brings a new character into the show in a way that feels natural as well as interesting. Naturally the episode titled “Nora” should focus on her and it certainly delivers on that. It seemed to me from her brief appearances last season that Jessica Parker Kennedy would bring a good energy to the show and it seems I was right. She is a positive addition with a lot of passion and optimism. Her very presence seems to elevate the show to something resembling the tone in the first season as it appears to form a baseline for how the other characters conduct themselves. Once again I’m not saying that one episode can fix everything but if the rest of the season builds on the strengths of this episode then we’ll certainly be onto a winner. Nora’s presence on the show opens up a number of storytelling possibilities. 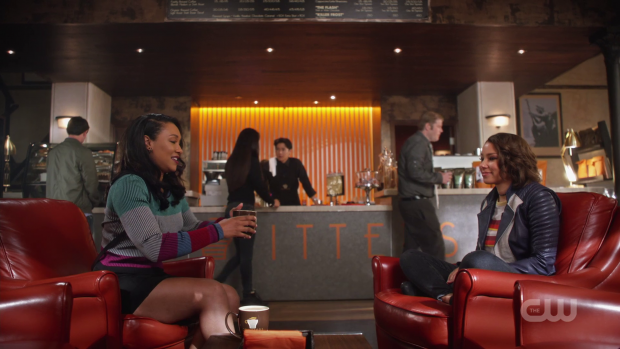 The fact that she is the adult daughter of Barry and Iris appearing to them before the point she was even conceived is a great idea as it puts Barry, Iris and the rest of Team Flash in a position of temptation as they have access to an information resource who can basically deliver spoilers on exactly what will happen in their lives over the next 30 years. Of course her being there provides the potential to change those outcomes but that’s an entirely separate issue. Early on it is made clear that talking about the future is off limits though Nora can’t seem to help herself out of excitement. She casually talks about villains that will be fought, The Flash Museum, a future battle between King Shark and Gorilla Grodd and various other things. It’s largely played for laughs such as Cisco declaring “spoiler alert” but there’s an undercurrent of mystery here as it slowly becomes clear that Nora isn’t simply stuck in the past. Initially she appears to take after Barry more than Iris as she has followed his footsteps as a CSI, fights crime under the alias XS and has an encyclopaedic knowledge of every battle Barry fought as The Flash. It’s easy to dismiss it as having a close relationship with her father but looking beneath the surface it comes across more like fandom than first-hand knowledge. 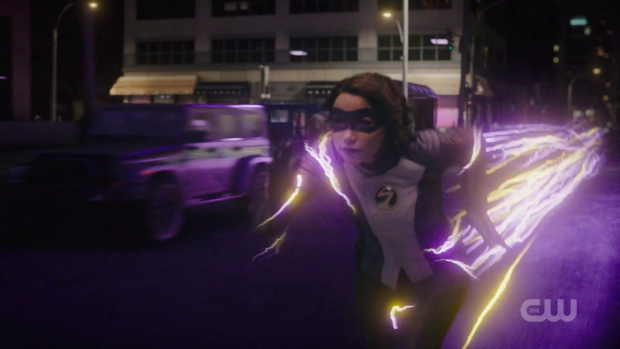 Barry picks up on this and confronts her about it only to learn that the newspaper headline that we have seen variations of since the first episode but almost always features a headline about The Flash vanishing in some sort of “Crisis” is an event that happened very early into Nora’s lifetime meaning she has no memory of her father. To make matters worse Barry still hasn’t returned 25 years after going missing so Nora grew up without a father to help her make sense of her abilities and help her figure out her purpose in life. The reasons she would want to travel back in time to meet her father are obvious and it makes for an interesting problem for Barry to face. On one hand he has learned time and time again that messing with the timeline isn’t a good thing so wants to make sure future events are preserved so that Nora’s world doesn’t disappear but on the other hand he doesn’t want to return Nora to a future where she has to live without her father so he has a difficult conflict to reconcile. Ultimately he decides that having her around is a good thing as it allows him to get to know her after learning that he won’t be around for most of her life while she is able to get to know him. Barry’s discussion with Iris about firsts becomes particularly poignant later in the episode. His disappearance early in her life means that he misses a lot of those which fuels Nora’s motivation for travelling back in time. 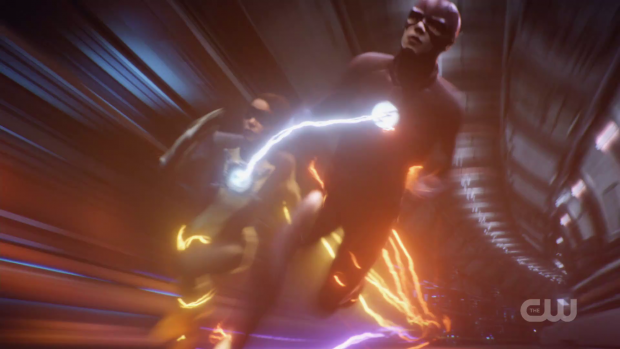 Even though the initial discussion is about potentially missing out on having Nora if she changes the timeline too much it becomes especially poignant when the realisation dawns that Barry won’t be around to experience those. Nora reacts to the loss of her father by learning everything she can about him. The Flash Museum is one way to do that because it chronicles every adventure Barry has as The Flash in great detail which makes it a great resource for Nora to learn from. The episode doesn’t delve much into it but presumably Iris as well as the rest of Team Flash told her a lot about her dad as well. Second hand information can only take her so far and has clearly intensified her curiosity about what sort of man her father was. At her core she feels incomplete because she never had that relationship with her father. There also seems to be a tension in her relationship with Iris that has yet to be explored but is hinted at in this episode. She picks up on the fact that Nora has more in common with Barry and is disappointed in that as she would expect to have some kind of influence on her. I found this hint interesting as there is a lot of potential to explore a mother/daughter relationship that suffers after the loss of the other parent. It’s particularly interesting in this instance as Iris will be trying to pre-emptively repair that connection while Nora has deal with the rift that doesn’t exist for this version of her mother. There are other drawbacks to Nora growing up without a father. Barry being absent means that she didn’t have anyone to teach her how to master her powers. The lack of a relationship between them is personified by her lacking the ability to phase through solid objects. It’s unclear why Wally or Jesse couldn’t teach her how to do that but for the purposes of the father/daughter relationship it’s a clear example of what Nora is missing in her life. Seeing her learn how to phase at Barry’s instruction makes for a really good moment amidst a high stakes situation involving a crashing plane. Despite the stakes it feels like a really intimate moment that creates a connection between Barry and Nora. Barry’s use of the same words Eobard Thawne used to teach him how to phase is a really nice touch as it shows he values the advice even if Thawne turned out to be his enemy. It’s also a really cool and creative sequence. Nora takes on another function within the show. I was heavily critical of the writing last season as the characters failed to learn from mistakes or remember anything that went on in previous episodes. Nora’s extensive knowledge of Team Flash’ exploits almost become a meta gag as she seems to know more about their lives than they do. I’m hoping that the relevant references to past adventures. This episode stumbles a lot on the villain front. Gridlock (Daniel Cudmore) is so forgettable that he could have been removed without the episode losing anything meaningful. Anything to do with him distracts from the more interesting Nora plot. 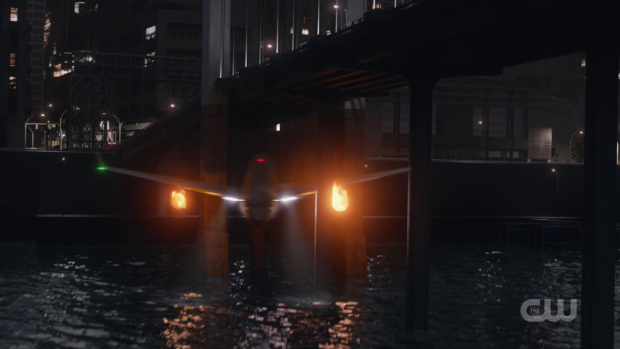 He is responsible for the crashing plane at the end of the episode but the same could have been accomplished with a simple accident. Cicada (Chris Klein) isn’t especially interesting either as another example of a masked villain with a distorted voice and unclear motivations at this point. There are still a few things the show needs to tidy up in order to massively improve the quality. As I mentioned earlier in this review it feels that there has been something of a shift in how this show approaches characters and that is most apparent in Ralph. As always he is the comic relief though it’s far less forced and irritating than it has been in the past. Most of his scenes involve him coming to terms with the idea of time travel and alternate universes which does manage to be more amusing than not. If Ralph continues on this trajectory then it’s possible that he could be rehabilitated at least to some degree. Cisco and Caitlin fail to have anything interesting going on. Cisco being drunk because he finally has the chance to process his break-up with Gypsy feels forced and the ongoing Caitlin/Killer Frost saga fails to resonate. It’s possible that there is no way to make this subplot interesting and there are definitely better things that Caitlin could be doing. Another character that continues to be underserved is Wally. Unfortunately he won’t be continuing as a full time cast member on DC’s Legends of Tomorrow. Presumably he will be given some form of send-off on that show but this episode proves that the writers of this show are incapable of using him properly. His basic function here is a spare part who disappears for a while before returning to deliver a small amount of exposition before being given Joe’s blessing to go off and finish finding himself. Barry and Iris come across far better than they normally do. Nora’s presence seems to have given them a greater sense of maturity and responsibility. 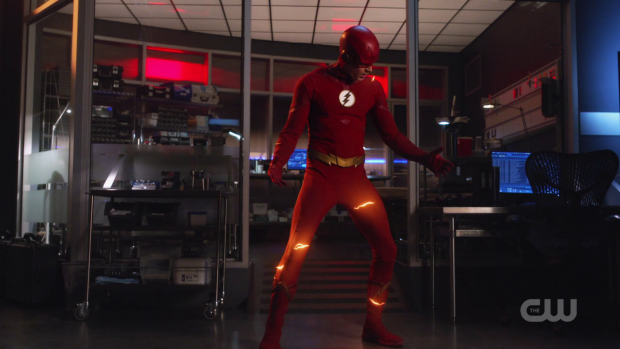 Barry revisiting his older costumes is a clear indication that he is moving forward in some way. The appearance of the first and second season costumes is a metaphor for him having outgrown his more naïve days and the new costume that he will be wearing from now on is hopefully a hint that we will see a more mature version of this character this season. Bringing up his Crisis disappearance once again might be a hint that the show is building to this especially considering Nora wants to prevent this though it’s unclear if it will be featured in this season or if it’s something the show is building to years from now. A strong opening to the season that represents something of a course correction from previous mistakes. Barry and Iris appear more mature than they normally do, Ralph is less insufferable and the presence of Nora seems to have fixed the tone to some degree. Many of the previous problems still exist such as not knowing what to do with Caitlin and the mistreatment of Wally but there are definite improvements throughout this episode. Nora is a breath of fresh air with a great energy and the way the episode builds to the reveal of her reason for being in the past and her lack of relationship with her father in the future works really well. I like that she’s staying for a while because she makes for a great addition to the cast and there’s plenty of scope for her to impact the show in fascinating ways.